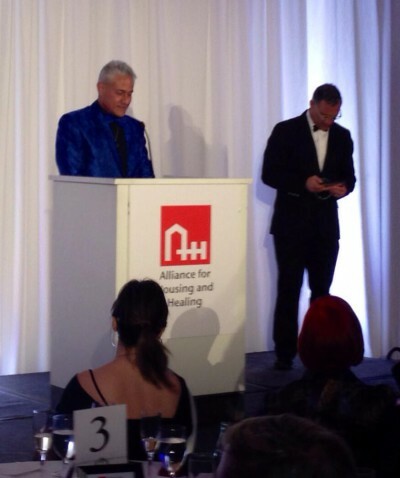 A lovely event called A Faire of the Heart benefiting the Alliance for Housing and Healing took place last week and among the honorees were Greg Louganis and his husband Johnny Chaillot. Both have done so much for HIV-AIDS individually and together and it was clearly a special evening for this couple who were married in 2013. ‘When I look back – and Greg and I are both in our mid 50s – I can’t help but think of that generation that we lost. How much we miss them and how much they made me cry,’ said Chaillot who has volunteered for Meals on Wheels and Lazarus House. Louganis took the crowd back to 1988 as he was training for the Olympics in Seoul, South Korea. He had won double gold at the 1984 Olympics and in 1976, as a high school teen, he took silver. These Olympics would be unlike any other because six months before the competition, Louganis found out he was HIV-positive. His initial reaction was to want to quit training, lock himself in his house and wait to die. But he soon realized the healthiest thing he could do is to focus on his diving. He kept the diagnosis a secret – even from his coach. ‘The younger generation forgets, had I come forward, I would not have been allowed to come in to Seoul,’ Louganis said. He repeated as two-time Olympic champion while on the drug AZT which he had to take every four hours around the clock. ‘I had no idea the significance of that,’ he said of winning while on AZT. Louganis praised the work of The Alliance for Housing and Healing works to provide housing and supportive services to people living in poverty with HIV/AIDS or other challenging health conditions. ‘They offer respect,’ he said. Also honored during the evening was Dr. Dale Prokupek (Humanitarian Award) and ModernHEALTH (Leading Luminary) and Brenda Goodman, the event’s co-chair who was surprised with an award for her long service to the organization. The dinner was charmingly hosted by handsome twins Gregory Zarian and Lawrence Zarian.